Roscommon is an old wool-town, deriving its name (Coman’s wood) from a monastery founded here by St. Coman in 746. 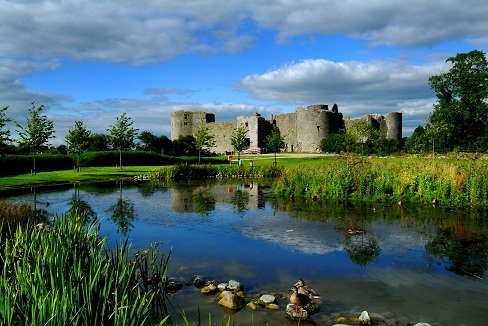 The most conspicuous building is the huge Roscommon Castle, immediately north of the town, to the left of the road. It was erected by Sir Robert de Ufford, justiciar of Ireland, in 1280 but suffered considerably in the wars of the 16-17Cs. It was partially dismantled by General John Reynolds in 1652, but is thought to have been inhabited as late as 1691. The mullioned windows were added c 1580. The outer enclosure, entered through a fortified gateway, is defended by a drum-tower at each angle; in the inner court is the building that contained the state apartments. The Dominican priory in the lower part of the town, founded by Phelim O’Conor, King of Connacht, in 1257, and rebuilt in 1453, has a very long and narrow church with a fine west window. On the north side of the choir is a tomb with a damaged figure, said to be that of the founder; the four armed galloglasses that guard it appear to be of later workmanship. The classical Court House (1736) in the town centre, has a tower and dome. About 5km northeast is the demesne of Hollywell, taking its name from a well dedicated St. Brigid. The Gunning sisters, Maria and Elizabeth, daughters of the poverty-stricken James Gunning of Castlecoote, whose beauty was the toast of London in the 1750s, are said to have owed their complexions to its water; they became respectively, Countess of Coventry, and Duchess of first Hamilton, and later Argyll. The foolish Maria died aged 23 from cosmetic poisoning due to excessive use of white lead. At Athleague, 9km southwest of Roscommon, is the ‘Fort of the Earls’, divided by a trench across the middle after a series of indecisive contests between 2 rival nobles. The Castlestrange Stone is a good example of Late Iron Age decoration. The mansion of Castle Strange was accidentally burnt. Roscommon is full of history and is a must see on your Ireland tours.